These beers are made regularly and are generally in stock. Luchador is a cross between a traditional Mexican lager and a Belgian Strong Ale. We wanted to make a beer that was drinkable like Corona (ie. a water substitute) but actually had some depth of flavor. We also wanted to make a beer that didn't have the mouthfeel of a lager or the production times/conditions required for lagers. We developed a german grain bill and tested it with various yeasts trying to balance historic elements of Mexican lagers, flavor, alcohol, and hops. We landed on a belgian yeast on top of a traditionally Mexican style ale and hit a home run. 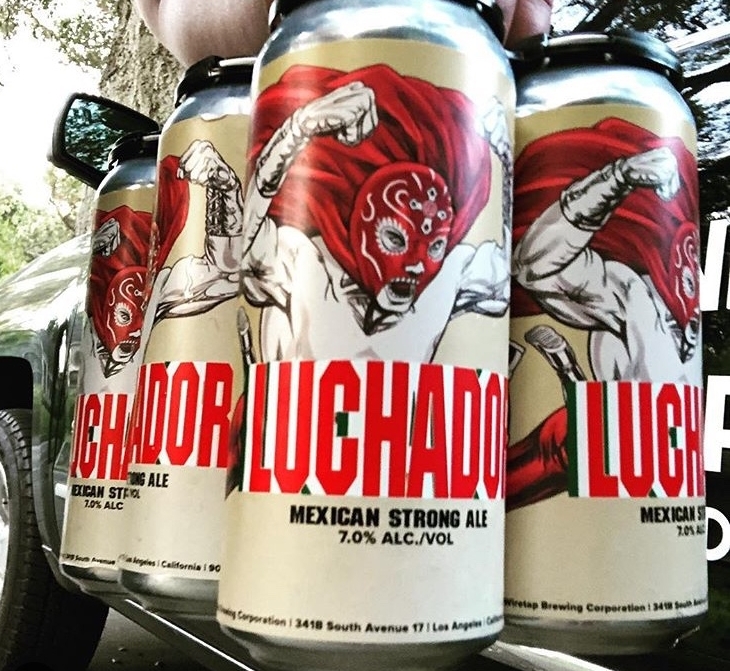 While Luchador has no Wiretap analogy the character of someone strong, yet soft, comical, yet bold, comes through as a great description for this beer. It is by far one of our most popular beers when available and at 5% you'll feel as triumphant as Nacho Libre himself. Echelon is an English pale ale modeled after classic pale ales found throughout pubs in the UK. With a moderate ABV it's a great session ale and with some added British hops there's abundant flavour. ECHELON aside from a fantastic beer is also the secret codename given to a project primarily conducted by British Secret Intelligence Service (SIS/MI6) for the interception and monitoring of communications on the Intelsat satellite network. The program was founded in the 60s and continues today, allegedly. There really isn't a great story to this other than Kolsch is probably one of the most underrated beers outside of Germany, one of the best session beers to exist, and yet one of the most misunderstood in the global community. Our Kolsch is made with 100% German grain, 100% German hops, yeast that White Labs probably stole from a forest outside Cologne, and LA water that we've filtered in a very Germanic way. We swear you can get on a plane and fly to Köln, drink all the Kolsch you can, fly back and have this and will swear someone flew home with a bottle of the real stuff. KryptoKolsch annoyingly replaces the C of Cryptocurrency and is a reference to the popularity and ambiguity of crypto currencies. While that doesn't directly tie to wiretapping it does to money, and yes, this beer is money. NSA IPA is Wiretap's first India Pale Ale and our effort to bring something new to a market where IPAs are rampant and often jam packed with hops. We crafted a very delicious black beer based on malts such as chocolate and black patent and brought in some smooth but aromatic English hops to just teeter on the edge of an IPA classification. Combined with a little more carbonation than normal this IPA is full of flavors that are balanced while still being crisp and easy to drink more than one. Much like the American government's National Security Agency our black IPA is bold, ominous, dark, and full of secrets. Have you ever had a beer that knew everything about you? During our development years we realized we were making a lot of dark beers which was isolating some of our test groups to humans with beards. Considering our wide supply of predominantly European grains and hops and a lack of desire to make additional English or German rooted beers we delved into pilsners in the heart of the Ottoman empire and came out with a Czech style pilsner. Very crisp and very pale gold in color. Much taste. More alcohol. Long ago in a world where very low bitrates were exchanged between devices using titanic sized plugs was the era of serial ports. It happened to be that the very first company started by the founders of Wiretap more than two decades ago was called Serial Technologies. While an inherently stupid name in retrospect it was too easy to work Czech into Technology and there you have it. These beers comprise seasonal, limited, or rare releases. With notice some of these can be reproduced at any time. Periodically we have been asked to supply beer that will appease those who require such beers as ones offering alcoholic refreshment in under 100 calories. While some might find this annoying we thought it was an interesting opportunity to make a light beer that isn't trash. Cronk Lite is a pale ale that comes in right at 100cal per 12oz and is quite dry yet drinkable as we have taken every available sugar and fermented it to develop a miracle of science like this. Some have asked if Cronk has a relation to the German word Kronk which means sick. It does not. CTRL+ALT is Wiretap's take on a classic German Altbier. Despite it's literal translation of 'old' this beer is crisp with a hint of bitterness but backed with a nice roast malt and chocolate to create a very refreshing beer. As many computer users can recall the key sequence of control, alternate, delete is the bailout from a frozen computer or some other equal electronic tragedy. While Altbiers still enjoy plenty of popularity in their hometown of Düsseldorf we felt the beer could use a reboot here in America. Cymbopogon is the scientific name for lemongrass and represents our take on an IPA. We dialed back the bitter and doubled down on the floral and when mixed with imported lemongrass during the fermentation makes a fun and complex India Pale Ale. It has enough hops to please the IPA fan but enough flavor to appease to the "I dont like IPAs" hater. Balanced and floral. Cymbopogon, or Cymbo as we like to abbreviate it, has no connection to technology or wiretapping. Vauxhall is one of Wiretap's flagship beers offering a rich, slightly creamy, English stout, supercharged with cold brew coffee. Low in acidity, high in flavor, and only a medium carbonation make this an ideal beer to pair with a variety of food or just savour on its own. Vauxhall Cross is the name of the building of the home of the British secret service building sitting on the river Thames in the heart of London. Like the building itself -large, prominent, and robust, we felt it was a great metaphor for our equally robust English stout with cold brew coffee. We used to make cider and then found out we needed a different ABC license and no longer do. Damn they were good. Cipher is an amazing dry cider brewed with vanilla beans, orange peel, star anise, cloves, and cinnamon. While this might sound like an apple pie all of these flavors take what would otherwise be a very tart and dull cider and make it smooth and delicious boosting the original apple flavor rather than one dominating the other. Traditionally a cipher is a mode of secret writing or hiding code. In the case of this cider we felt the name Cipher conveyed not only a word close to cider but also a way of describing the sneak attack of 10% ABV masked in a delicious easy to drink dry cider. We learned after nearly a year of licensing that our current beer license does not permit us to sell this. We will resume regular production when we rectify that.